I’ll give extra points (and eat a baguette) for anyone who knows who’s lyric I stole and adapted there. Ellen and I are off for our next trip tonight. 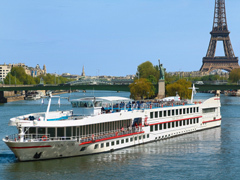 We will take our third Viking River Cruise, this time a 8 day cruise from Paris to Normandy. We are excited to get back to Europe, to spend the first day and a half in Paris, then make our way to Normandy. So come along for the ride. Comment if you have questions or suggestions. Sign up in the upper right corner to get email updates with each post. This entry was posted on Saturday, March 23rd, 2013 at 4:18 pm	and tagged with France, Paris, Vacation, Viking and posted in France, Paris. You can follow any responses to this entry through the RSS 2.0 feed. Kevin says Jimmy Buffet! Have fun.